Traditional bar, line, Japanese candle, semi-log and Point & Figure charts are available in all time frames from one minute to monthly. 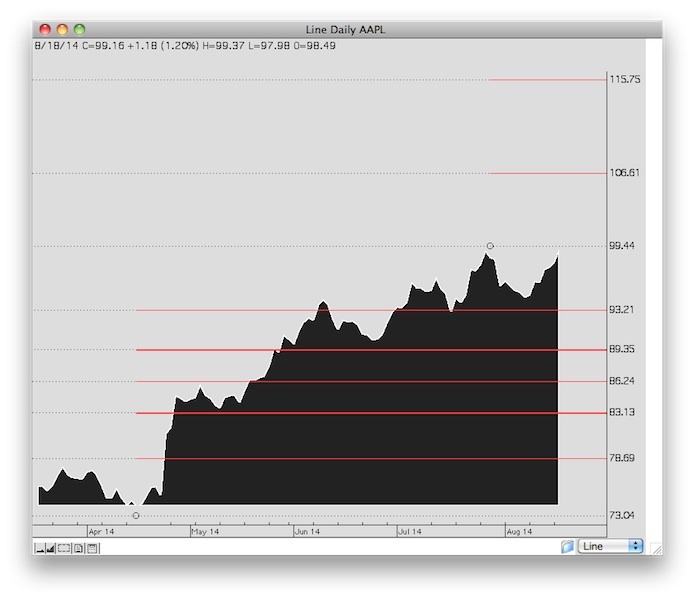 And all charts, regardless of time frame, update every time a trade occurs. Personal Hotline offers the best technical studies from respected market experts such as George Lane, Welles Wilder, Gerald Appel, Joe Granville, John Bollinger including some of our own proprietary indicators. From Gann to Fibonacci, Larry Williams to Alexander Elder, Donald Lambert to Marc Chaiken, John Carter to Larry Connors, its all here, over 50 technical tools in all. 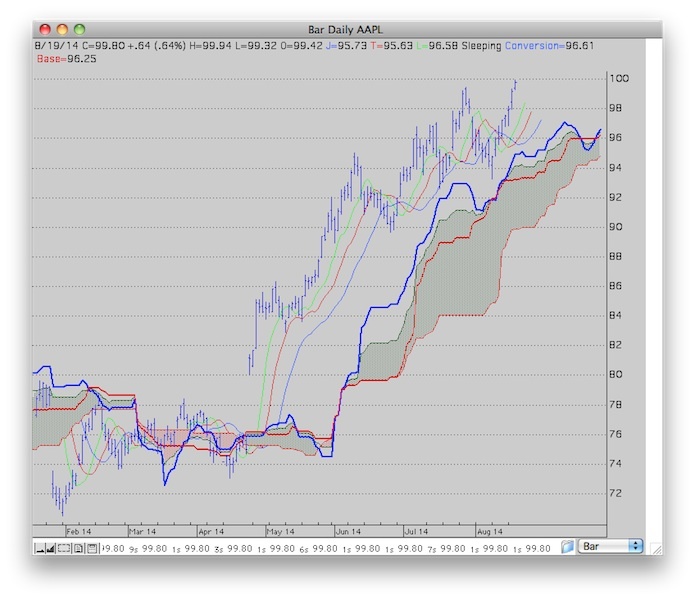 Ichimoku Cloud - The full name of this indicator is "Ichimoku Kinko Hyo" which translates to One Glance Equilibrium Chart. This indicator defines support and resistance, identifies trend direction, gauges momentum and provides trading signals, in a single glance making it one of the most efficient technical methods available. Many of today's indicator's are complex, combining multiple indicators into one like the TTM Squeeze which combines Bollinger Bands, Keltner Channels and Momemntum. From the simple to the sophisticated we make it truly easy to use and to understand. No programming required and HotlineX will alert you when the your choice of indicators presents a buying or a selling opportunity. Fibonacci retracements and extensions as seen in this daily line chart may be applied effortlessly to any type or timeframe of chart. Traders are awed by our Computer Generated Trendlines that can track and chart significant highs and lows in the blink of an eye. 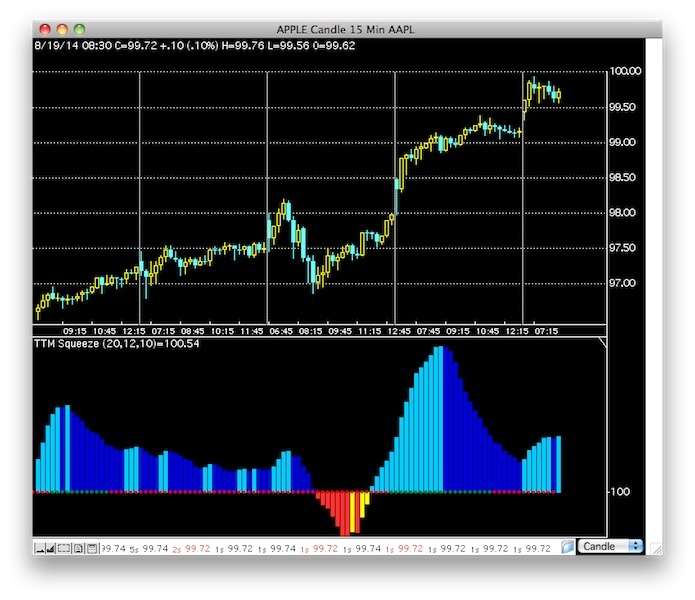 This same intelligence can be used to draw Fibonacci, Gann, Trident Linear Regression and Speed Lines. 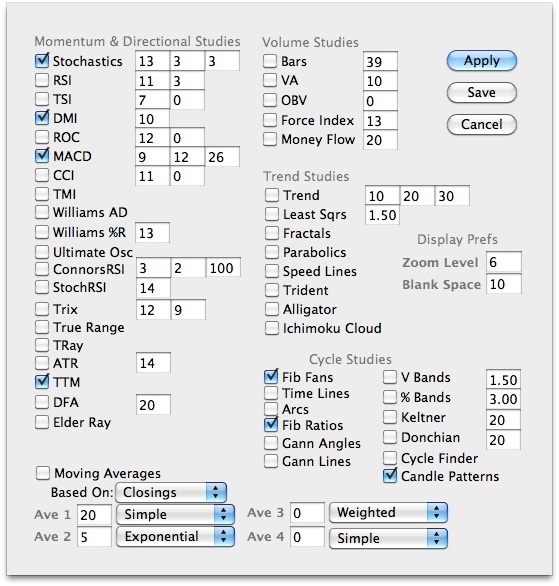 Personal preferences for study smoothing, formulation and display characteristics are stored independently for each type of chart, allowing this simple to operate, sophisticated research resource to be customized to your unique specifications. Turn multiple technical analysis tools on or off in an instant, apply them to the current chart or save them as a default. 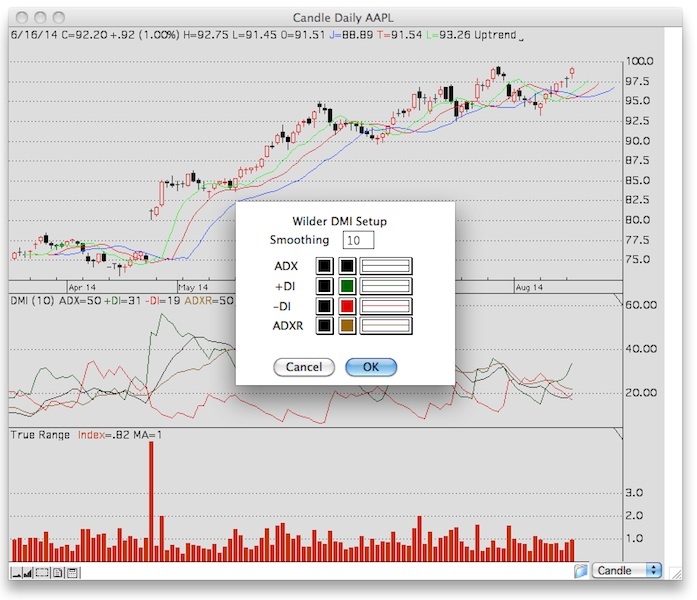 Separate settings can be easily specified as default for each chart type and timeframe and you can add or subtract indicators after the chart is drawn.